The falsity of these representations may form the backbone of a class action Prevagen lawsuit based on fairly rudimentary scientific knowledge. 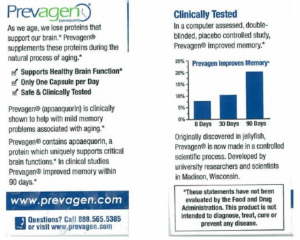 Insofar as Prevagen’s sole active ingredient (apoaequorin) is a protein, upon ingestion it is broken down into its amino acid constituent parts – a process identical to the metabolization of all other proteins, none of which improve memory or brain function. Additionally, even if Prevagen were not fully metabolized and was to enter the bloodstream, it could not pass through the blood-brain barrier and gain entry into the brain, thus making it impossible that Prevagen could impact memory function. Prevagen sales between 2007 and 2015 have been estimated at $165 million. 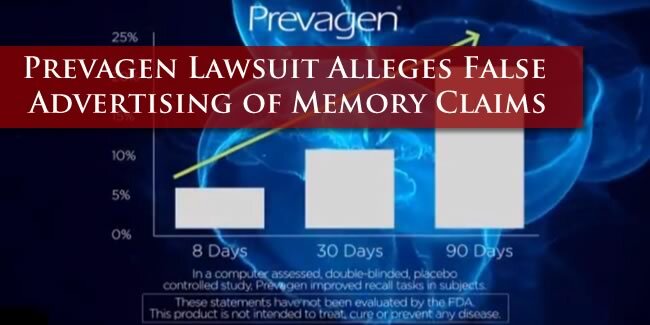 If you have purchased Prevagen based on representations that it could enhance your memory or other cognitive functioning, you are urged to contact an attorney at Audet & Partners, LLP for a free, confidential case evaluation. You can reach us either by completing and submitting the inquiry form on the right side of this page, or by giving us a call at (800) 965-1461.